Gamma training didn't work as well as usual. It didn't help that my heart rate was way up there (let's pretend we didn't see those 130+ figures shall we, and why didn't rest while I was thankfully waiting for my appointment to start drop it? Scary to think maybe it did. ), probably because I stupidly climbed the stairs out of the subway station instead of taking the escalator. What was I thinking? My leg muscles, busily seizing up and going into pain, were asking the same thing. My legs recovered pretty quickly. Breathing and heart not so much. Oh well, live and learn. We didn't really train for inhibiting 8-10Hz today I noticed, but it made no diff because it dropped really low anyway. However, 2-4Hz, which we only monitor, was not so hot. You're tired, my trainer told me. Yeah, that's what happens when, except for the first two nights after last week's LORETA, you can't even reach six hours of sleep. Argh! Even those first two nights were not rocking it at only seven hours of sleep. I napped both days this past weekend. Truly, a need to nap is no longer normal for me. I actually ended up hating the effects of last week's LORETA so much, I emailed my feedback early. Not enough stimulation, we decided, given there was no narration, no text to read, no dialogue, just music and visuals. Nice DVD, not running it with my brain again, let me tell you, for it deep-sixed my reading, blanked my mind completely for long minutes at a time, hid words from my word-retrieval system, and made me go the wrong way on the subway. Talk about feeling like a twit. It also put me into Flatville, which the gamma training this week reversed. I felt like I'd regressed a few years and was back in those old fun-brain-injury times. So a lesson learned: that DVD may be good for beginners and people with high anxiety, but not for someone like me. Working on the working memory network was supposed to help my reading, but maybe my reading problems are so multi-faceted, that we need to work on several aspects at once, aspects like slow reading, word find, working memory network, (multi-tasking? ), stuff like that. We're going to try having me read closed captions again in the kind of educational DVDs I'd been watching up till last week for half the LORETA session this week. They'll analyze the results, and I'll tell them how the following days went, and then we'll decide the following week whether to continue with the new protocol with reading or return to the old protocol. 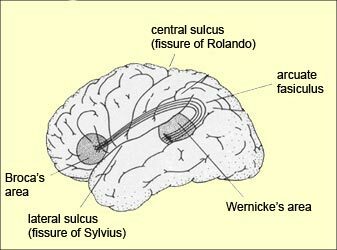 In addition, during next week's gamma session, we'll assess my brain activity at Wernicke's area. If it's too alpha-intense, we'll try stimulating it to produce more brain activity. Wernicke's is involved in language. I recall back in 2005/2006 some discussion about that area in me not working all that well. I still don't know what kind of aphasia I had because people told me when my brain was busy napping instead of processing. What got in, I retained. But an awful lot didn't get in, and that was one of them. I'm just going to say one thing: it's the cruellest joke ever that my brain injury kiboshed my reading. OK, back to dealing with it. Because, really, what else can one do? Image courtesy of http://thebrain.mcgill.ca under Copyleft.